Botanists at the University of Washington's Burke Museum of Natural History & Culture have created a much-needed second edition of the "Flora of the Pacific Northwest." Published by the UW Press, the new edition took five years to complete and is the first update on Pacific Northwest vascular plant diversity and distributions since the book was first published in 1973. In the past 45 years, much has changed: The second edition documents the doubling of nonnative species in the Pacific Northwest, the addition of 1,000 taxa — including species, subspecies and varieties — to the region's flora, and the reclassification or renaming of 40 percent of the taxa in the first edition. The original "Flora of the Pacific Northwest" became an instant classic for its innovative style providing species descriptions in the identification keys and for its comprehensive illustrations of nearly all treated taxa. Students rely on it as an essential primer, while veteran botanists and natural resource managers use it as the definitive reference for the region's flora. "This book enables us to be better stewards, we know what's here, whether it's common or rare, or invasive," said David Giblin, collection manager for the UW Herbarium at the Burke Museum. "It enhances our ability to preserve plant diversity in our region for future generations." This completely revised and updated edition captures the advances in vascular plant systematics since the first edition. These advances, together with significant changes in plant nomenclature, the description of taxa new to science from the region, and the recent documentation of new native and nonnative species in the Pacific Northwest, required a thorough revision of this authoritative work. These enhancements make this new edition the most comprehensive reference on Pacific Northwest vascular plants for professional and amateur botanists, ecologists, rare plant biologists, plant taxonomy instructors, land managers, nursery professionals and gardeners. The 1,100 new taxa consist mainly of existing native and nonnative species newly documented in the region, as well as a number of taxa new to science. Many of the new regional records were collected during the herbarium's annual forays held throughout the Pacific Northwest. "With the recent revision of 'The Jepson Manual of California Plants,' and the soon-to-be-completed 'Flora of Oregon,' up to date floristic treatments are now available for the entire West Coast of the U.S.," said Richard Olmstead, UW biology professor and curator of the UW Herbarium at the Burke Museum. The new illustrations are in the style of the 3,000 original illustrations, by illustrators Jeanne R. Janish and John Ramely, found in the 1973 edition of the "Flora." 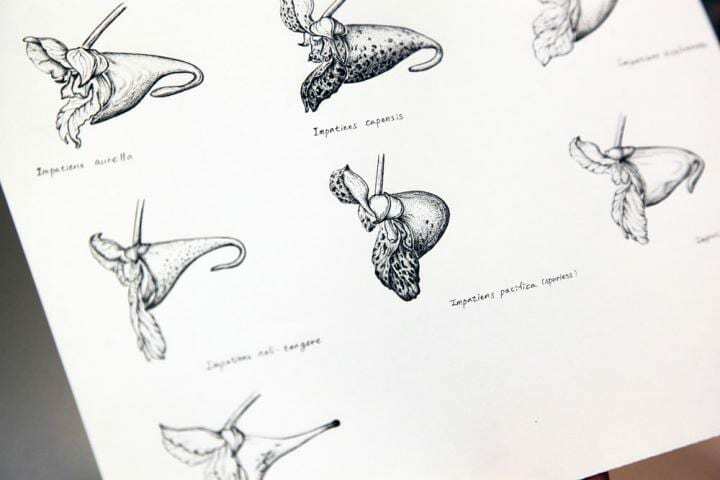 Crystal Shin, a scientific illustrator and the primary illustrator for the revision, worked to match the style of the original illustrations so the more than 1,300 new illustrations she created seamlessly fit. "Before inking, I study the style and techniques that Jeanne used on a similar species," said Shin. "I like her work very much and my ink drawing style is pretty close to hers." Shin started the illustration process with a plant specimen by reviewing the specimen's characteristics with one of the Burke Museum botanists. Together they determined which parts of the plant to include in the illustration. Shin then used a microscope and magnifying glass to examine the plant's details, specifically its length of hairs, textures, marks, veins, shapes and more. After studying the plant, she proceeded with the illustration process of pencil sketching and then inking. Project staff then scanned, edited and archived the illustrations for later placement alongside the text. It took approximately two hours to complete each illustration before being placed on the page in the book. The newest edition of "Flora of the Pacific Northwest" can be purchased for $75.00 at the University Bookstore, local bookstores, and book retailers across the country and online.